Poor confused heart. I feel sorry for it. But I appreciate it. However it has occasionally been telling me the 'calvary is not coming', and we may have to deal with the worst. First thing in the morning it is dosed with losartan, metoprolol and aspirin. The metoprolol works to slow it's beat down to about 40 beats per minute. Within minutes of the metoprolol it is hit with a jolt of freshly brewed bold and rich coffee out of the French press, something I know is probably not so smart but without the coffee I walk around in a zombie state all day long. Cardiac confusion sets in as the metoprolol tells it to slow down and the coffee tells it to speed up. After the second cup of java the coffee wins out over metoprolol and the blood pressure begins to rise. To offset the rise in blood pressure from the coffee that pulls me out of zombie land I start with prayer, Yoga and breathing therapy. Now while the heart is beginning to race my focused breathing and calming focus on omniscient love somehow mitigate the caffeine's effects. After slowing from the metoprolol dose, then speeding from the coffee and again slowing from the Yoga, my fingers and toes begin to go through their daily chill, as my partially functioning heart can't pump enough blood to the now constricting peripheral arteries. And as the peripheral arteries constrict, the Yoga slowed heart starts pumping harder and harder to move blood to the fingers and toes. At this time I know AFIB is moments away. But as I tire of coffee after the first two cups and turn to ginger and green tea, the heart starts slowing once more. Ginger tea, socks and a hot shower help with peripheral blood flow and once more the heart relaxes. The sun now a couple hours in the sky and feeling relaxed, I walk outside, making a decision to either go for a walk or ride my bike. Once into the walk or ride my heart starts beating harder and harder….sigh. Worrying about too fast a pulse and potential effect on my dissected aorta I return to the house and lay down by the bedroom window to take a nap, slowing my heart again as I fall asleep, totally exhausted from the little bit of morning's physical activity. Waking from the nap I open a letter from Division of Motor Vehicles to see that my driver's license has been medically suspended or some other typical 'bash-the-disabled' letter (I have begun to dislike the U.S. Postal Service as they have become a barer of bad news more than once lately). Coping with huge challenges like these, especially unexpected ones sends the cardiac muscle into overdrive, and one day may be the cause of an aneurysm. I slip another big blue metoprolol under my tongue and let it dissolve. If the big blue pill doesn't help I pop a losartan. Soon my heart shifts from racing mode back into slow mo through by this time my chest is hurting from the constant changes in slow, fast, slow, fast, slow, fast, slow motion. I know my heart does not do well on the roller coaster-like ride each day. Dietary changes, as well as constant physical therapy and a focus on spirituality are helping me level the valleys and peaks somewhat. But I still have a long ways to go. This journey of getting to know my new heart in a much more intimate way than I ever knew it before is now becoming a passion. Not only do I want to live a long time but I want to try and heal my flopping, torn, ripped main artery that runs down from the Dacron tube atop my heart down into my chest, kidneys and legs. I have learned so much, especially lately. But there is so much more to learn. And much of what I've discovered has not come from doctors but from others suffering from the same and similar challenges. So much swirls around inside my stroke damaged brain. Ideas, observations, theories, notes, comments and thoughts of mine own and of my friends are interwoven with those of volumes of proven medical data and surgical experience. A tiny light is glowing way down the very long, dark tunnel. I am excited about this light. Soon, with diet, spirituality, my medications, more physical therapy, the help of my family, my friends and the ability to manage stress my heart may learn to shrug it all off and settle into a steady rhythm. I call that hope. Maybe, just maybe way off in the distance I am thinking I hear a bugle and the rumble of that elusive last-minute calvary charge. Maybe my heart might soon not be quite so confused anymore. Today is Friday and I am alive and writing about how I thought I was going to die just forty eight hours ago and at that time I had no clue as to why I felt as though my aorta was about to aneuryze. But now I know what happened, thanks to several research papers published to the internet and input from others who are challenged with similar conditions. I would like to take this opportunity to share my experience with others. Hopefully someone suffering from these symptoms may find this information useful and the following links educational, for feeling like death is imminent can be an unsettling experience. This Wednesday, November 13th, I retired to the bedroom early in the evening, feeling especially tired and lay out my sleeping pad by the tall, opened bedroom window. I sleep on the floor because of my back and feel so much better for doing so, but sleeping on the floor is another story. The bedroom window opens out to the large screened lanai over the pool. The lanai is surrounded by Judy's herb and flower gardens which are in turn enclosed by a thick pine and saw palmetto flatwoods forest area. When the moon is full the shimmering light dances across the broadleaf palmetto, reflecting nature's silhouettes on the swimming pool's surface. Cool breezes laden with oxygen from the woods flow into the window and cover me while I sleep, filling my lungs with fresh, invigorating air. Wednesday's weather forecast called for a low pressure system to move in from the north, rapidly covering the area with the year's first heavy cold air. Sometime, around three a.m. I woke, my St. Jude aortic pounding loudly, my pulse racing. The front was coming through, bringing with it forty mile an hour winds. The tall pines swayed more than I'd ever before seen them sway. My chest tightened as though someone was reaching around me squeezing me tightly. But the cooler air felt good across my face and I rolled to my side to see if the mechanical valve would quieten. The valve beat louder and faster and the pain did not subside. Alarmed, I rolled up to my hands and knees, stood and walked into the bathroom to take a Losartan tablet as well as my beloved beta-blocker, Metoprolol. Usually an extra dose will calm things down when unexpected heart pain hits. Sometimes my medication induced vivid and colorful dreams can really jump the blood pressure and pulse, but I could not remember any such dream having taken place that night and my chest was much tighter than normal. Was this an anxiety attack? I'd not experienced this level of discomfort since my dissection but the sensation was much different than the aorta tear. 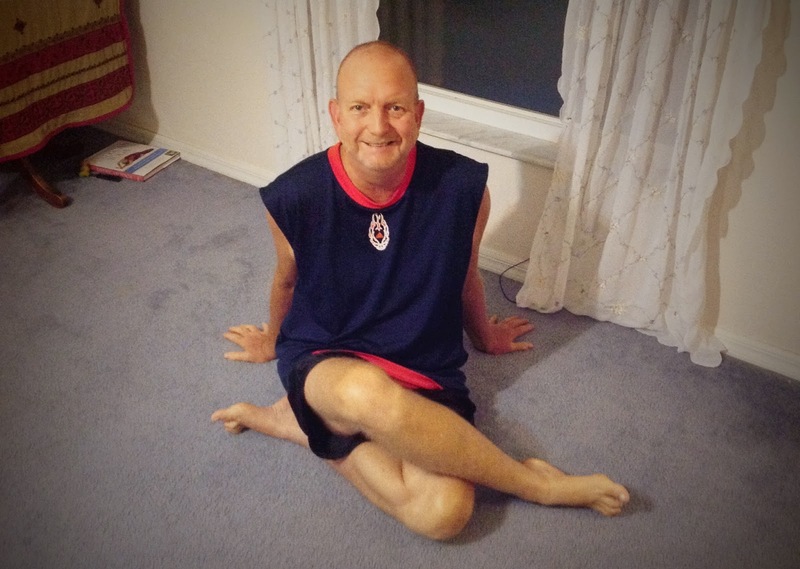 I sat down on the floor and began to do gentle stretching exercises, hoping to release the muscle tension. No luck. Turned on the Ipad's relaxing music station, and again no success. Working with my breathing usually helps but not that night. So I lay back down, covered up and waited for whatever challenge my body had in store for me. Sleep eluded me for the next several hours and when daylight finally broke I was glad. The pain persisted. My blood pressure soared, especially the systolic. I just knew the big aorta tear was around the corner. Times like these are difficult because I can go to the ER like most everyone including the doctor usually suggests but doing so always results in a contrast dye CT scan. I have been in renal failure already and absolutely hate the contrast dye. Avoiding the ER is always my first thought because of my kidneys and because the doctors usually can not figure out what is happening anyway. They give me some pills and send me on my way until the next incident where they run a CT scan, scratch their heads, give me some pills and send me on my way once more. By early after noon the horrible pain was gone and I felt as good as ever. The weather front had moved through and sunny, cool blue filled the afternoon skies. Then it struck me. I bet it was the weather. Blame the weather. It just made sense. My mom and I talk about our mechanical valves always rattling louder during storms or when a system comes through. I was almost sure my intense pain was do to the weather. So I started researching the internet's library of barometric related health conditions. Turns out I found the culprit, at least so I am convinced. Looking to the NOAA weather site for barometric pressure tracking in Florida, I found that as the cold front came through the local barometric pressure quickly dropped by almost an inch of mercury over a very short time span. As a scuba diver (pre-dissection) I was well aware of what differences in ambient pressure can do to the body. Interestingly, an inch mercury drop in barometric pressure could be compared to climbing several thousand feet or more in altitude in a matter of minutes. As air pressure decreases, available oxygen also decreases. Because my heart's output function is already extremely low due to my dissection, valve damage and surgery stress, it has a hard time supplying my body with the oxygen I need. When, all of a sudden my body is screaming for more oxygen because the existing air O2 content has just dramatically decreased, my heart freaks out. And wow, did it ever as the cold front was racing through. Interestingly, my pulse really was not affected after I had taken the big blue pill at 3 a.m. Metoprolol controls my pulse like a hen-pecked husband who is stifled by his over bearing wife. But because my heart could not pump faster, it beat 'harder'. Peripheral arterial vessels constricted and my systolic pressure shot through the roof. It was like jamming on the brake and throwing down the accelerator all at the same time, a mega Valsalva maneuver. Worst of all I had no idea of what was happening. But now I do. And I want to share it with you, just in case you are ever faced with the same symptoms. and another post on barometric health issues by the Mayo Clinic. As the cold front passed, the barometric pressure rose with the influx of clear, cold air and my heart and chest, felt so much better. My blood pressure settled to normal. Frighteningly though, there are plenty of studies and data to show that cardiac fatalities do occur on a frequent basis associated with weather systems arriving and departing. I truly believe I am lucky to have survived the first real cold front of my post-dissection life. Unfortunately I am not sure what to next time a fast moving cold front comes through. I may shut the window, hoping the enclosed house will mitigate the sudden drop in pressure and allow me to acclimate to the pressure drop somehow. I may hide under the covers and pray, or take a hot shower, or who knows. If you have suffered similar barometric attacks I'd love to hear how you deal with the frightening symptoms. Sheeez. Living with Marfan, connective tissue complications and a dissected aorta is a challenge. But I am up for it so bring it on. Here is a short parody about waking up, a blend of ballet and orchestra in the bedroom. I will call the typical daily event my "Marf Morning Musical". Enjoy! Drum rolls start as my Coumadin dose is now due and without the beta-blocker my St. Jude aortic valve is clicking louder and louder, faster and faster. The St. Jude drum section wakens me from a fitful sleep of wild, medication induced dreams. The only way to quiet the drum section is to take my meds. That means getting up. So I stretch and the stringed up sternum section sends a loud thunderous pop, louder than the St. Jude drums, as my unstable sternum pops open once more, as it does every morning. Added to the sternum pop is the prolonged and melodious 'owwwch" coming from my lips as the chest cage breaks apart. It has been two years since the last cut through and still no healing (Thank You connective tissue disorders!). Of course the pain from the popping sternum sends the St. Jude valve section into wild non-rythmic AFIB or VTACH beating, changing the beat from a slow 4/4 to a rushing drum roll. Now I know I must quickly reach the medication drawer and slip a big blue pill under my tongue. I roll over to my hands and knees, up from the floor bed pad I've made because my lower back detests the bed mattress and push up to a standing position, taking the first few steps towards the bathroom and the pills. Ker-pop, ker-pop, ker-pop echos the sound of me walking across sheets of bubble wrap strewn across the floor. Of course there is no bubble wrap laying anywhere in our house. But my knees, ankles and other joints must go through their daily popping, releasing all the body gas built up in the joint sections. But with the ker-pops and St. Jude valve section in full play, my seemingly beautiful and graceful dance across the floor ends up with a loud crash into the bathroom door as the connective tissue in my ankle gives way and my tall, lanky frame flings furiously forward. No, that is not blue make up covering my forearms and face, just bruises from the Coumadin regime and the morning smacks from the floor, doors, dresser and walls. Things begin to slow down with my first cup of dark roast in the French press and a hot shower. Then then pick up again as the day progresses. Such is the Marf Morning Musical. I know there are lots of you out there who can relate. It is good to know I am not alone with my music and dance.